When I was sweating out boot camp George was manning a communications station on Eniwetok. He was a founder of the National Association of Atomic Veterans. He remembers how it was, when part of the duty was having to muster outside on the beach whenever they set off an atomic bomb. OAK happened on 26 June, 1958. This is taken from “An Atomic Bomb Test Veterans Remembers” by George Mace, by permission. From the 6th of May through the 11th of August of 1958 no less than 35 nuclear devices were tested at Eniwetok Atoll, Bikini Atoll and the Johnston Islands. This was an awful lot of detonations in just over three months. All total 35.6 megatons were detonated which equals 1,781 Hiroshima size bombs! Later in life I found out that the United States and Soviet Union were negotiating a Limited Nuclear Test Ban Treaty and both sides wanted to test as many nuclear devices as possible before sitting down at the table! Every detonation was called a “SHOT” and at that time I wasn’t told their Code Names, how far away they were, or their size. Any information that we received concerning the tests came a week late, when we read the Hawaii Newspapers. Whenever I ask how far away the detonations were, I was always told about 50 miles. Years later I found out that the 22 detonations conducted at Eniwetok Atoll were never more than 15 miles from the island of FRED (his station, ed) and consisted of a mixture of atomic and hydrogen devices. I also discovered that the 11 detonations that took place at Bikini Atoll, about 150 miles east of Eniwetok, had a nasty habit of drifting their radioactive clouds over us! I know this because in 1979 I had the government sent me the declassified Operation Hardtack-I plans, which included wind drift charts for all SHOTS. 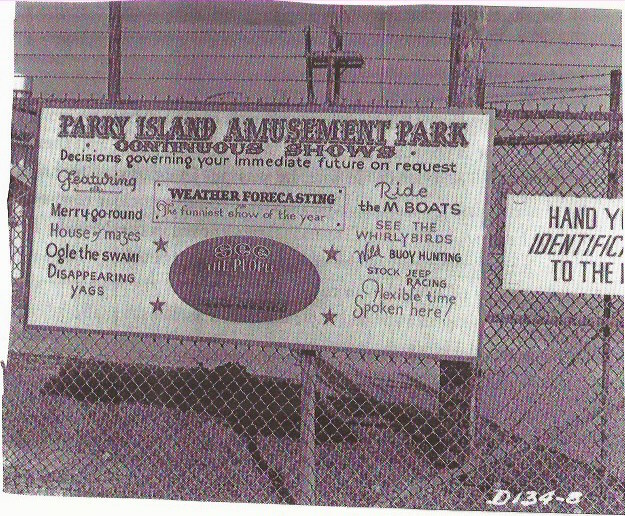 I paid Uncle Sam $35.00 for these Xerox copies, however I’m glad I did as they are no longer available. Once it became known that veterans were expressing an interest in nuclear testing, almost all government sources dried up. 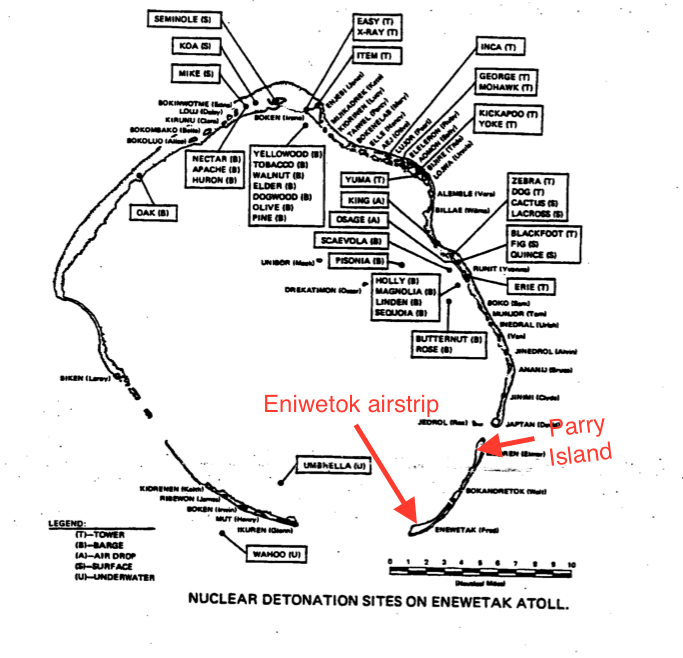 Eniwetok Atoll consists of dozens of tiny islands (about 40) formed in a rough circle, with a lagoon of mostly calm waters in the center and shallow and deep entrances between the islands to the sea. The center of the lagoon was deep enough for navy ships to enter through the deep entrances to deliver materials and personnel. From my island I could only see one other island ELMER, about two miles away. The next island from ELMER was named DAVID (Japtan) and on it a small group of men (13) manning an Army Signal Corp radio receiver site was commanded by Sergeant Orville Kelly. Their task was to receive all incoming messages from the Army portion of the task force scattered around the islands and relay them to my island FRED. All kinds of animals and electronic test equipment were placed on these islands by Army personnel and retrieved after each shot. Within 15 years Orville was diagnosed with lymphatic cancer; became the first veteran awarded service connected benefits for exposure to bomb radiation and died in June 1980, just 6 months after winning his seven year battle with the government!! I would come to know this man before he died and go on to help his widow Wanda, form the National Association of Atomic Veterans. But that’s a whole other event in my life for future recall. Some of the nuclear devices must have come by plane as they would be loaded on flatbed trucks, guys with machine guns and I remember thinking “Who’s going to steal this bomb and where would they go with it?” We were never told ahead of time that a shot was going to occur, but the day before they had one they would anchor our water tower down with cables and trucks. For most of the SHOT detonations at Eniwetok all personnel would be assembled on the lagoon side of the island, sitting with our backs to the blast, heads on our knees and our arms over our eyes. Officers had welders goggles and could watch the whole show. Only after the fireball died down could we turn and look at the cloud rising. I did learn to respect (Fear) the tremendous power displayed by each detonation. A few seconds after detonation you would see this tremendous flash and then a wave of heat would feel like the sun coming up on your back. The largest shot I ever witnessed was code named OAK on 29 June 1958 and the heat on my back got to the point of becoming uncomfortable. In fact it started to burn my skin right through my shirt. Once the fireball had subsided I turned around to see the water column rising into the sky and forming the familiar mushroom cloud. Then high winds hit me within minutes or seconds. It’s hard to put a time frame on it though because time really stands still when you see something like that. This was all very scary of course but it was also really beautiful. There are so many colors to it, especially in a Pacific island setting; there’s the aqua green water and a brilliant red residue from the fireball, and then the luminous white mushroom cloud going up into a clear blue sky. It’s awe- inspiring and my first emotion was pure amazement. Only years later did I find out that the OAK detonation was a nine megaton hydrogen bomb detonated on a landing craft, about 15 miles from my island. We sandbagged the island beforehand, because it was only seven feet above sea level. When OAK detonated there was this wink of light that I sensed through my closed eyes and arms, just like a flashbulb going off inside my head. And when I turned to see the column of water rising out of the lagoon, it was so tremendous that no one spoke. You could hear the sound waves bouncing off the islands, one after another. Boom! Boom!, as it came down the atoll chain. When the sound wave hit Eniwetok, the whole island shook and a hot wind blew our baseball caps off, but within seconds the wind reversed and sucked in toward the bomb. The column was surrounded by ragged haloes of white shock waves, which produced an electrical field. I actually experienced an electrical field passing through me; my arm hair stood up and there was a cracking sensation all through me that was as much felt as heard. I knew what this was because I had felt the same effect when in the field of a high- powered radio antenna. There was also a metallic taste in my mouth, like when chewing gum foil touches a tooth filling. And that mushroom cloud just continued to build and grow until it had risen about sixty or seventy thousand feet into the air and covered the entire atoll. A circle of islands about fifteen miles in diameter were all shadowed by this terrifying, magnificent thing. I remember talk of evacuating the islands because of concern about fallout, but it never occurred. After fifteen or twenty minutes, the water in the lagoon began to recede until the lagoon bottom lay exposed for about two hundred yards from shore. I could see sunken PT boats and equipment from WWII that was normally covered by fifteen or twenty feet of water. I really thought the earth had cracked and that the water was running into it! I mean, it had to go somewhere, right? Finally, the water stopped receding and it just stood there like a wall for a minute. I thought of Moses and the parting of the Red Sea, for it must have looked like this! Then it started coming back and I got a sick feeling, because here I was on this dinky little island, not very wide, and here comes what seemed like the whole ocean. The wave hit the island and sprayed up over the sandbags and all day long the water kept seesawing back and forth. Because of this agitation, the lagoon water turned an ugly milk chocolate brown and it started to rain very hard. At this point the effects of the bomb detonation took on apocalyptic gloom and I felt oppressed! Prometheus had stolen heavens fire and Pandoras’ box spilled a nuclear holocaust on mankind forever! The lagoon water was off limits for swimming for three days, but the ironic part of it was that the lagoon was our source of drinking water, after it went through the desalinization plant, which didn’t remove radiation from it. The mighty OAK had dug a crater 183 feet deep in the lagoon and 4,400 feet in diameter. It also made a good size dent in my memory bank! Another SHOT named PINE occurred on 27 July and was detonated in the lagoon, on a barge off of Janet Island, again about 15 miles from my island. 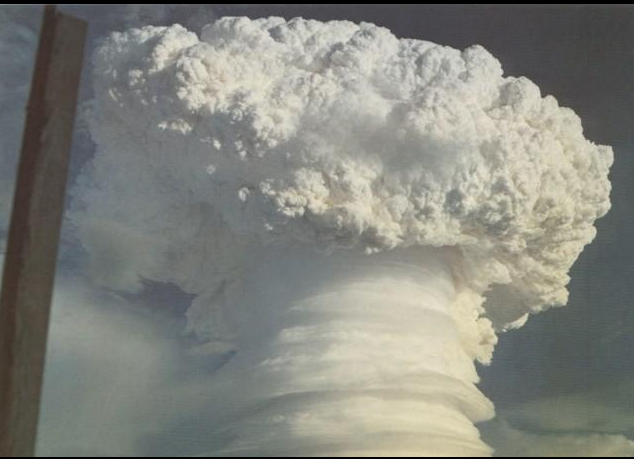 This was a 2 megaton bomb and the mushroom cloud rose to 66,000 feet. Later information I obtained from the government stated this bomb used two primaries for detonation. This indicates the device was a two stage thermonuclear bomb, using Tritium and Deuterium, (both by products of hydrogen) and not the normal lithium deuteride. Through study I found out this was done to maximize the release of neutrons; therefore the PINE SHOT must have been a neutron bomb. During this 1950’s time period the United States had announced it was developing a Clean Bomb with very little radiation fallout and minimum blast damage; however the massive release of neutrons would kill or damage all living matter for miles around. Such a bomb would permit U.S. ground troops to enter enemy towns immediately after bombing, with little concern about radiation fallout or military resistance; and as a bonus the buildings and utilities would still be intact! I still wonder if my fifteen miles was far enough away! It’s interesting now, years later, to remember that the OAK and PINE SHOTS were detonated at sea level; which means that an awful lot of coral became radioactive fallout in the atmosphere and stratosphere throughout the planet. It would be years before this “stuff” came down! And today the medical profession wonders why there is so much wide spread cancer. My experiences at Eniwetok may sound to some as a fun time, but I can assure you that nine months living on a small island with thousands of other men, (and one tree) was no picnic. At age 23 and very naive I didn’t give any thought about the 1945 Atomic destruction of Hiroshima or Nagasaki. Having grown up during WWII, I was taught to hate the Japanese and that the Atomic Bomb ended the war and saved thousands of American soldiers’ lives. This was 1958 and my country needed nuclear weapons to defend our freedom and keep the world safe. In fact, I was proud to be part of this nuclear weapon development and would have agreed to their use on any enemy. This mind set would change later when I discovered that the government of the United States was not above lying to their own people and the world, concerning nuclear weapons or reactors. Operation Hardtack-I delivered the coup-de-grace’ to Bikini and Eniwetok Atolls as they would never again serve for the testing of nuclear devices. Bikini is still unlivable today. From 1946 to 1958 Bikini withstood 23 detonations and Eniwetok 46 detonations. Over the years the United States spent hundreds of millions of dollars trying to clean up the atolls. Natives from these atolls still live as Wards of the United States on a single congested island, where we relocated them over 50 years ago. Just as we had done to the American Indian, the United States once again destroyed the physical environment and cultural ecology of an entire race. What goes around, comes around and we’re not going to like it! To add insult to injury, in later years the United States and Japan dumped radioactive waste into the sea trenches of the Marshall Islands. Henry Kissinger summed it all up by saying “there’s only a few thousand natives out there and who gives a damn!” I do Henry, I do!! I was assigned to McGuire Air Force Base, New Jersey to finish out my tour of duty. The Air Force at that time was down sizing, so I got a 60 day early out and was discharged 15 December 1958. Three years, ten months and one day of active duty. George would go home, the work at the Pacific Proving Grounds (PPG) would go on. This is the light-hearted sign posted next to the main gate. At the head of the island that held the airstrip was PARRY, the headquarters where William Ogle and General Starbird and other VIPs had their offices. Once this had been a Japanese seaplane base, and the ramp was still there. I sense that there would never be a happier time for Bill Ogle than when he was working at Parry Island. Behold the sign, does it say young guys buzzing around in Piper Cubs live here, guys hopping from one dirt strip to another? All the locals had been cleared out so you don’t have to bother with natives and learning another language. Getting about in Jeeps, lots of barbecues on the beaches. It was paradise, but the bombs kept getting bigger, and as they chewed up and made the islands radioactive, the area they could test in kept shrinking. They put their bombs in barges and those detonations left a lot of radiation in the ground and in the lagoon. And they were messy forgetful hurried harried people, perhaps because they had the President and Joint Chiefs pushing them and they had no budget for cleanup. When all the testing was over, the palms were dying, and there were whole islands missing. They had evacuated the natives to the tiny island of Ujelang (.72 square miles in area). There was near-famine and epidemics, especially in the 50s, due to the scarce supply of fish and vegetables. Their inhabitants wanted to return to Enewetak and a highly publicized meeting was held at Ujelang in 1979 to discuss the issue. The meeting gained national attention because the CBS television show 60 Minutes went along and publicized the islanders begging to return to Enewetak. By 1954, Sandia had the prototype of something droppable. 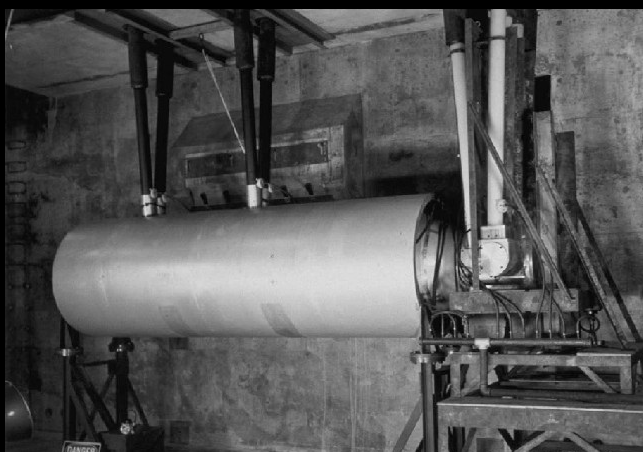 This was the ten ton weapon tested on March 1, 1954. They had to look for more working room when it came time to shoot the sardonically-named: “Shrimp.” Eniwetok’s atoll was twelve miles in diameter and more or less used up and beat up by then. A land of broken palm trees, smashed up buildings, radioactive craters, and a huge network of firing and monitoring cables. The Shrimp was a real monster, a cylinder 58” in diameter weighing about 23,500 pounds. For the test it was built into a so-called “shot cab” that contained a lot of high-speed observation machinery. There was some uncertainty on how “big” the explosion would be. Nearby Bikini had two unused islands in its chain that were twenty miles apart. Surely having a twenty mile separation between the shot island of Ramu, where the building holding the device was buried, and the control island of Enyu where the shot group was located was enough to keep the shot party safe. It wasn’t. Bill Ogle, the Deputy Scientific Director of the Joint Task Force overseeing testing, couldn’t believe it when the nine man group reported that within minutes of detonation the radiation outside the bunker was so high they couldn’t come outside. Having the control room in an underground bunker with three- foot thick walls didn’t insulate the eight men in the firing party from the shock. Bernie O’Keefe, one of the founders of E G and G and one of the nine men, said the big building floated around as if it was on “a bowl of jelly. ” For a while he thought that the firing bunker and the island had been knocked off its perch and ended up in the depths of the ocean floor until they went outside and the island was still there. Outside their shelter the reading was 40 Roentgens. They fled back inside when the readings kept rising. If they had been trapped outside, the lethal level would have been reached in eight minutes. Everything unprotected on the island was dying. They had come to work without rad-safe clothing, and when helicopters were dispatched to rescue them, they had to tear up sheets for makeshift protection. Rongellap atoll was in the path of the fallout and the natives had to be evacuated. Further out to sea a small Japanese trawler was working unnoticed. When they returned to port, the crew of the ironically named “Lucky Dragon” were all sick. One died. Radiation fallout would become a worldwide issue in Australia, Japan and the United States. As usual the homo sapiens are still defecating on the planet on a global scale radioactive or otherwise ! It amazes me that they haven’t totally destroyed their own race already. Its only a matter of time. Look at the China Syndrome that happened in Japan recently. Huge amounts of radio active water is still spilling into the Pacific Ocean ! Its a warm and cozy feeling to dine on a little can of tuna fish and wonder if its radio active ! The radiation is spread all over the planet ! Idiots !